Map Description I take no credit for this map as it is basically still Deck16, I made this map for a friend who is the admin of the House of Chaos server and was sick of the original over played deck. Since he is a big fan of Fetid I kinda combined deck with fetid style tubes and added some connectivity to the map. I uploaded this map against my better judgement(Knowing most people are sick of deck remixes) but all the people who played it on server said it was far better than the original so here it is. I like it, it keeps the original intact but it feels like this would be the actual finished version, unlike the stock version.And I mean how the geometry was added or changed, pretty cool. I dunno , I just happen to think it's a cool map now. It also lets you FINALY walk around to places you couldn't get to before, in a logical flow. Oh, and play this before anyone goes off on a "deck" map rant. It is burning, your fingers are burning and waiting to play this map LoL. Thanks for the comments Redfist, it is kinda amazing how a couple minor changes can make such a major difference in the flow of the map, plus the tubed hallways are better for all the spam monkeys out there. I was going to fix some minor bugs and maybe retexture some of the plain stuff and add some more details before uploading, but scince no one complained about any of those things I decided it was good enough as is. PS. Redfist you can find some of your better maps on my friends server too plus a bunch of other custom maps. EDIT: LOL, read the map description, it clearly says I take no credit for the map, and how the hell could anyone but a noob to UT get lost in deck even if it was all one texture? Seriously. Burn Deck with fire. BURN IT ALIVE. This map is below average for one reason IT'S NOT YOUR MAP. You just didn't change enough. Ans the halls are too similar you just don't know where you are. messing with a classic = suicide. 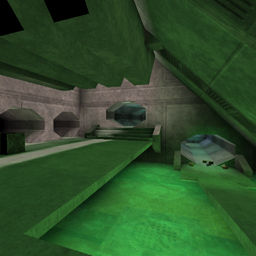 come on, using a classic as a base for your map is just asking for a slaughtering.. 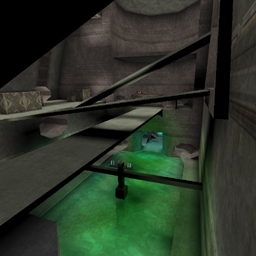 I'm not going to rate this map, because the original was made by epic. Some hallways have, imho, become cramped now though. - The dead ends (most) are indeed gone, and it does give a slightly better feel to the map. - A few health vials were added in one corridor.........that's all I can remember... otherwise, all items have remained on the map. Some were slightly relocated, to fit the new hallway structures. that deck16 has horrible lighting? The well known arguement is "well when I play I play and don't admire the looks of the maps etc etc.."
But it's horrible. Epic did a real bad job on this map. Well, it's epic map and they did the lighting and looks. I just wished they wouldn't have been altered as well. There are probably similar, but better, texture sets. The light really need to be toned down. This isn't 1999 or 2000 anymore, UT has evolved. Gameplay is important, yes, but so are looks imho.